Poverty is connected with obesity and other health problems. Our low-income neighbors in Lenawee County often avoid purchasing healthy foods because they are more expensive than unhealthy alternatives. That’s why Neighbors of Hope provides fresh, nutritional food to those in need through Third Day Farm. 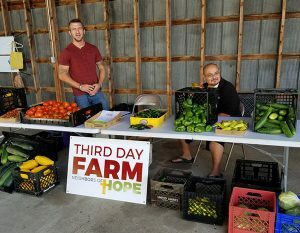 Operating on property provided by local church partnerships, the farm stocks Fishes & Loaves food pantry with nutritious produce grown right here in Lenawee County. Neighbors in need: Food produced through this farming ministry is distributed to those who need it through Fishes & Loaves food pantry. Men’s ministry participants: Our men take part in the planting, weeding, cultivation, harvesting, and distribution of crops. It’s a great opportunity for them to work hard, reap the God-given results, and give back to the community. They also benefit when a portion of the produce is served at our men’s ministry center. Members of the community: We also rely on volunteers to help grow and distribute the food. Helping out gives volunteers the opportunity to interact with program participants, share the love of Christ, and form supportive relationships. 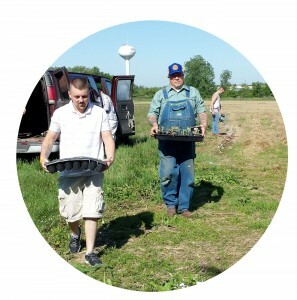 Churches, businesses, and other organizations: Local organizations can send teams of volunteers to help at the farm. In the future, we also hope to expand production and be able to sell extra produce to restaurants and food stores. Third Day Farm provides fresh produce to Fishes & Loaves food pantry. Whether you’re a farmer or a city dweller, you can become a Neighbor of Hope and help alleviate hunger in Lenawee County. Consider planting an extra row in your garden this growing season and donating the results to Fishes & Loaves food pantry. Even one extra plant will help. With just a little extra work, you can show Christ’s love to a family that depends on Neighbors of Hope for healthy food.